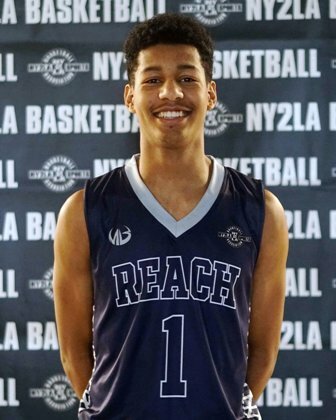 After a very strong summer competing in various events including the NY2LA Basketball Association and its related platforms, Harlond Beverly made a name for himself on a national level. The talented scoring wing continued that ascent with more solid performances and he’s firmly established himself as one of the prized national recruits in the Midwest in the 2019 class. Humble and continuing to develop, Beverly is appreciative of his current status and he’s hungry to continue to get better. "I love playing in the NY2LA events, it is all about the kids. The competition is always great and it gives me an opportunity to improve every time I hit the court," Beverly said. A virtual unknown prior to the fall of 2016, Beverly started to take flight after capturing MVP honors at the annual NY2LA Sports Futures Camp in October for the Class of 2019 and 15 months later he’s never looked back (Editors Note: Beverly also captured Class of 2019 Co-MVP honors at the NY2LA Futures Camp this past October). Fresh off a huge spring and summer campaign with the R.E.A.C.H. Legends in the NY2LA Basketball Association, Beverly has collected offers from schools all over the country. Michigan State, Baylor, Missouri, Ohio State, Toledo, Xavier, UNLV, and Arizona State have already offered with Texas and VCU are also keeping close eyes on the 6-4 athletic wing from Michigan. "The relationships I'm building with all of them are great. I'm just taking in the experiences and enjoying the process," said Beverly. "I don't have any visits coming up as of right now as I'm focusing on my season, but when the season’s over I'll schedule some visits," he added. For now Beverly is putting all of his focus towards the high school season where he is currently averaging 17 points, 7 assists, and 7 rebounds for his Southfield Christian School. "We had two early losses, but we will bounce back. We've been getting better and learning to play as a team and I’m looking forward to seeing what we can accomplish this season,” Beverly said. What’s already accomplished is that Beverly is a legitimate high major wing with the athleticism and skill package to deliver huge results at the next level with continued hard work. The talented Michigan standout is a must watch talent for high major programs in need of a high major scoring wing in the 2019 class. Beverly competes with the REACH Legends during the grassroots travel season.